There have been a few times in our sport’s history where it seemed the world held its breath to watch golf. It likely happened in 1930 when Jones capped off the unthinkable ‘Grandslam’ win. Again in Augusta, Georgia, when Nicklaus awakened from hibernation at the age of 46 to win his sixth green jacket. Most recently, Tiger in 2008 as he hobbled to victory on a torn knee. It’s moments like these that become the greatest marketing campaign our sport could ever get. There’s arguably no other sport where the perception of a level playing field exists — even the early duffer can sink a 40 footer every now and then. While with other sports, it becomes certain at point, playing baseball at Wrigley or dunking on Lebron is unlikely. Even a polished Power Point presentation couldn’t disprove the numbers. “Rounds played per year” is the standard barometer of measuring the sports popularity, however a much more alarming data point comes from a source most of us use every day: Google. 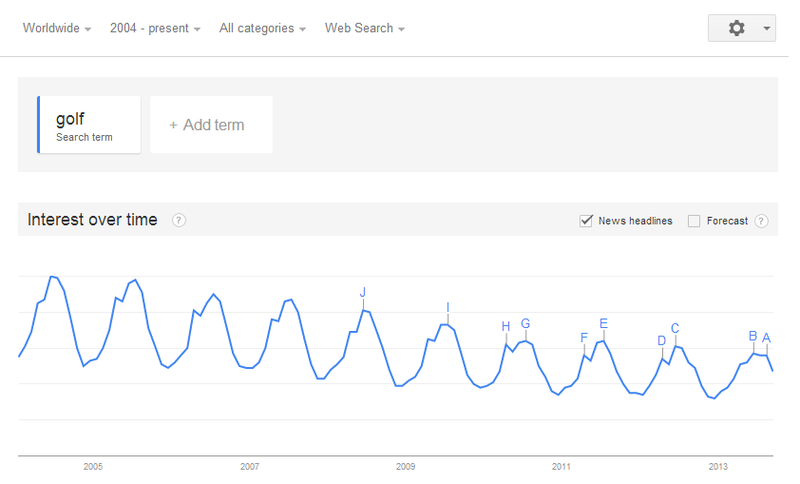 Search terms with the word “golf” have steadily dropped year after year since 2004. It’s down 40% since 04’. You can see below, each summer, the game hits its annual peak, falls in the winter months, only to rise again during Masters’ time (indicated by bump in April). Each year pundits matter-of-fact-ly suggest why golf is in decline. Nobody wants to belabor on the point because it’s uncomfortable. The typical reasons continue to rise: it takes too long, rounds are too expensive, it’s too exclusive, we need bigger holes, etc. The real problem is much deeper and solutions perhaps even tougher to find. While all the other reasons are considerations, technology continues to lead the decline. Not the bigger-driver-heads, longer-ball, range-finding type of technology, but the type of technology that’s disrupting industries across the nation. Before the internet disrupted the way we communicate, business deals were done in person. Mostly in person, sometimes on the phone, but almost always concluded with a handshake and a likely friendship. Buyers had less information, so they relied on personal relationships and trust as the backbone of commerce. Since no other sport cultivates relationships better than golf, it makes for a perfect marriage. Plato was onto something when he stated: “you can learn more about a man in an hour of play than in a year of conversation.” Playing business golf is safe, tried and true, but not scalable…or as scalable as the mechanisms today. Relationship oriented businesses have and will continue to fuel the golf business but technology is transforming industries rapidly. Information on the web make buyers more informed and relationships less of a commodity. For example, if I want an office printer, my first action is to go directly to Google and search “office printers Atlanta.” Within 15 minutes, I’ll know exactly what I want, the suitable price range, and reviews of what I’ll buy. Pre-internet, Facebook, and Twitter, a sales rep would have developed a strong, personal relationship with a company. He would have been the expert on all things printers and every time our office grew, we’d give him a call and talk about new options over a round of golf. Those days are less and less. Everything is open, online, and transparent. None of these adjectives describe golf. In a game baked-in of exclusion, there were barriers thwarting adoption from minorities and social classes, golf now has it’s own barrier to contend with: technology. We’re entering an era where the business leaders of today aren’t doing business on the golf course. Carnegie, Ford, Rockefeller — business tycoons of their time — were all golfers. Translate to today’s innovators: Ellison, Zuckerberg, Bezos, and the late Steve Jobs have never been associated with the game. The time it takes to play a round, a CEO could write a blog post read by millions. Golf has likely seen it’s brightest time in the business world, yet it definitely hasn’t seen it most popular time in history. We have to use technology to benefit the sport. As the game’s global expansion into developing countries continue, instruction and access is paramount. Organizing golf’s most passionate young players into communities outside of expensive clubs will be beneficial as well as providing quality instruction to those willing to give the game a try. Golf must embrace technology. There’s no reason a high-schooler in Argentina shouldn’t be able to take a video of their swing, upload it to YouTube, and receive feedback from a golf professional in the States. The love of the sport will be the driving force of golf’s growth and that’s a type player every true golfer wants in their outing. This entry was posted in Traditions of Golf and tagged decline of golf, Facts & Figures, history by . Bookmark the permalink.